Enjoy huge savings with this package of all three CD sets -- buy 2 and get one free! Follow this 12 week plan to enhance your financial fitness. You'll begin to see a world of opportunities that have always existed, but which you were never able to see before. Your eyes will be opened to ways to create true wealth. 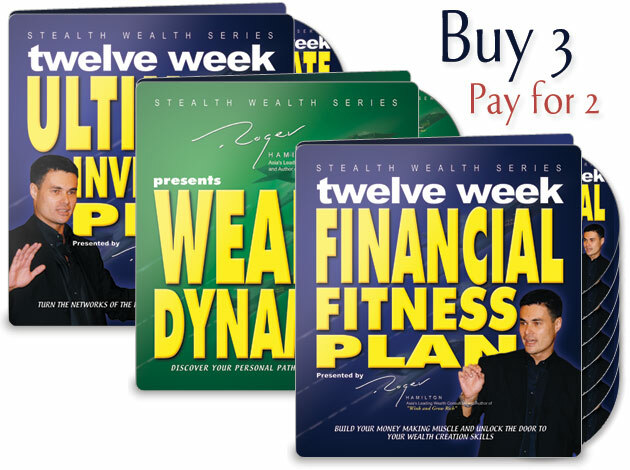 Discover how in 12 weeks you can build and use your connections and networks to create the wealth you've always dreamed of. Identify what your wealth really is...! Wealth Dynamics is a revolutionary technology that will guide you on your path to wealth by matching ALL the eight paths to wealth, with personality types. It provides the answers for anyone who has been confused or frustrated by the apparently conflicting advice of successful wealth creators. This special offer is only valid while old stock lasts! Click the button below to add the Three for Two Special (DOWNLOAD) to your wish list.